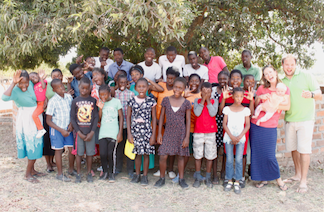 Kim and Brenden (and Alivia) Vowell are serving with Project Samuel in Central Zambia where they oversee a children's home and community development project. Project Samuel is a children's home and sustainability Project in Zambia, Africa. We provide for, love, care, and nurture, twenty-four previous orphaned children. These children have now found a new home and family with us at Project Samuel. The Project consist of permanent housing facilities, education and training facilities, and sustainability agricultural development endeavours. In addition to permanent facilities, Project Samuel takes its programs to the schools and villages in the communities we serve, helping children through educational programs, discipleship and mentoring, youth and sports outreach, and job training opportunities. Your support is vital in providing our children with education, food, housing, care, clothing, and development and growth opportunities. ****Are you a new Monthly Children's Sponsor?!?!? Welcome Aboard - We are so glad to have chosen to become a monthly partner and sponsor our incredible children!!! Please allocate your donations to "Children & Project Giving" and in the notes section that appears after making payment - Please write: Monthly Children's Sponsor! All other donors - please specify by choosing the appropriate drop-down menu whether your donation is to be allocated to "Brenden and Kim" or "Children and Project Needs". All finances designated for education, capital projects, community outreach, and missions opportunities, fall under "Children & Project Needs." Further notes can be added in the comment section that appears after payment details are entered. Thank you!